Susannah looked at her with mounting excitement. "It's another twin-thing." "Yes. Only this time Tweedle Dum and Tweedle Dee are science and magic. Rational and irrational. Sane and insane. No matter what terms you pick, that's a double-damned pair if there ever was one." 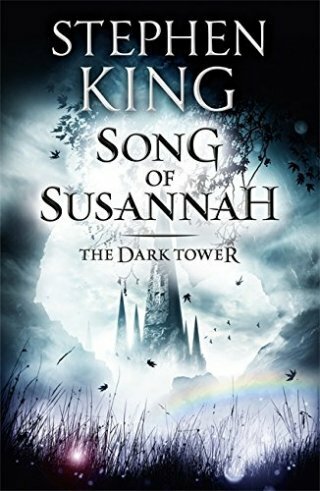 SONG OF SUSANNAH is the latest and penultimate chapter in the DARK TOWER saga, set in the alternate American West of Mid-World (yes, there are Tolkien references, too) and various realities and times of our world, following the fortunes of gunslinger Roland of Gilead and the three mismatched refugees from New York in various dates in our 20th Century who have joined him. It’s once again lavishly illustrated by Darrell Anderson. Susannah Dean, once the schizophrenic Odetta Holmes/Detta Walker, has now had her body taken over by a new personality, Mia, and has come to a version of New York in 1999 to bear a child, Mordred – by demonic means the son of Roland of Gilead, and destined to kill Roland and prevent him from saving the Dark Tower. There’s a poignant moment that will resonate with Dylan fans when Susannah, who is black, and as Odetta Holmes worked in Oxford, MS, in 1962 in the civil rights struggle, enters the headquarters of a major US corporation and is surprised to find a beautiful coffee-coloured receptionist. In 1964, when she came to Mid-World, no such company would ever have employed a person of mixed race, no matter how good-looking, as its face to the public! In the previous volume, WOLVES OF THE CALLA, where King reworked the “Seven Samurai”/”Magnificent Seven” story, he started with a synopsis of the series so far, but warned at the end of it that WOLVES was not the place to start reading, and advised all readers to start at the beginning. Not only do you need to know the complex plotlines, but you also need to have absorbed the atmosphere and background of the DARK TOWER series. So don’t start here either! This book does not have a beginning or an end, it just starts, continues the story, and then stops - when you don’t want it to. Fortunately the final novel in the sequence, THE DARK TOWER, will be published in September 2004 to conclude the story. A major character in WOLVES was Father Callahan from King’s 1975 vampire novel SALEM’S LOT, who had been transported to Mid-World, and was now again a priest in the border town of Calla Bryn Sturgis (a reference to “Magnificent Seven” director John Sturges). In this book Father Callahan has joined Roland’s band or “ka-tet” and goes with the boy Jake to New York in 1999 to stop Susannah-Mia, while Roland and Eddie Dean go back to 1977 in search of Calvin Tower, a rare book dealer from New York on the run from the “low men” in King’s home state of Maine. Tower holds the key to success in 1999, and the low men are agents of the Crimson King, King’s equivalent of Satan, who also appear in King’s HEARTS IN ATLANTIS. King puts himself as a character in the novel, albeit in an alternate reality - in 1977 meeting his characters Roland and Eddie, and in a coda purporting to be a writer’s journal, explaining the history of the Gunslinger stories. It reads convincingly but ends in 1999 after King has been killed in the hit-and-run accident that actually left him critically injured (see the picture below). Not only does he paint an unflattering portrait of himself, but he actually kills himself off! I haven’t read many of King’s horror stories, but I’ve followed this series since the beginning, and it’s kept me reading. As well as having a gift for plot and an eye for what makes readers (and viewers) jump, King has a cinematic style of writing that concentrates on describing actions rather than what the characters are thinking – this makes his work very suited for adaptation to the screen. This is less in evidence in the DARK TOWER series, and much of this book goes on in Susannah’s head, as she battles with the Mia personality. However, the DARK TOWER has a wider role - King himself said of Book 4, WIZARD AND GLASS, “I am coming to understand that Roland's world actually contains all the others of my making.” Indeed, BLACK HOUSE (the 2001 sequel to TALISMAN by Stephen King and Peter Straub) revealed more details about the Dark Tower and the Crimson King. King has apparently sneaked references to his other works into his books almost from the beginning but now he’s doing it much more overtly, using THE DARK TOWER to tie all his work together. Consequently, if you’re a King fan, this series is unmissable – if you’re not a King fan, try THE GUNSLINGER first. This review was commissioned for the British Science Fiction magazine "Vector", reviews editor Paul Billinger. The Missing Liner Notes from "Bob Dylan's Greatest Hits Vol. 3"